The D-Day Story tells the story of D-Day and the Battle of Normandy. It holds over 10,000 items – preserving, researching and acquiring objects to share with the public through exhibitions, workshops and other activities. 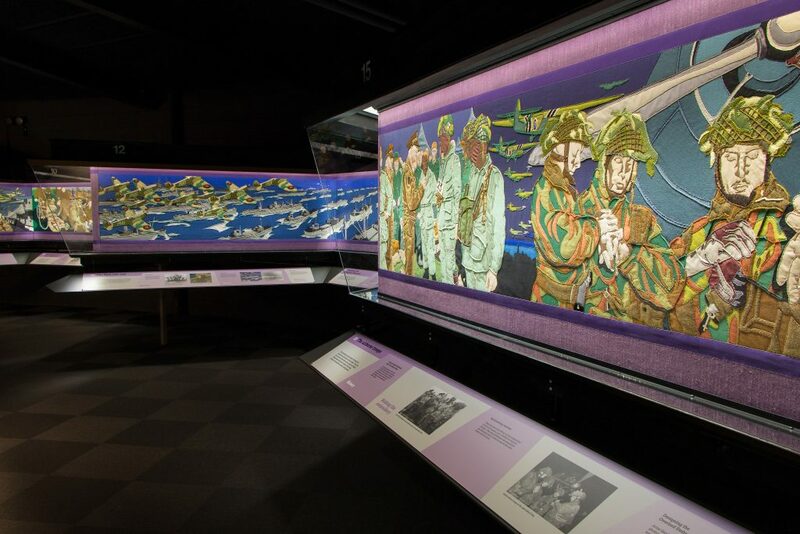 When entering the new £5m revamped D-Day Museum in Portsmouth, you are transported to a different time, a different world of a rich collection of objects and stories telling this significant and astounding story. What if however, you are blind or your visually impaired, how can the museum tell you the story you so want to hear? ATS Heritage have recently worked with VocalEyes, who assisted our team in writing the scripts for the audio descriptive tour needed for The Overlord Embroidery in the Legacy Gallery. The Overlord Embroidery was commissioned to remember those who took part in D-Day and the Battle of Normandy. The Museum has recently been a part of a huge redesign, with major improvements and access being offered to blind or partially sighted visitors. ATS were engaged to offer our end-to-end expertise in delivering audio described tours including new audio guide handsets and audio tour content development. Audio described tours have two main elements – painting pictures with words, helping visitors to visualise what is in front of them. The second is wayfinding and orientation, providing clear instructions to support an independent visit. Our team delivered audio guides to the museum, expertly telling the story of how the embroidery was made, including techniques and who was involved in its creation. ATS Heritage are privileged to work with a diverse range of clients, from museums to houses, cathedrals to stadiums and we strive to use our expertise to create pathways for all to enjoy and remember the rich heritage and history that is out there. Please click on the short audio clip to listen to an example of the The D-Day Story Audio described tour.